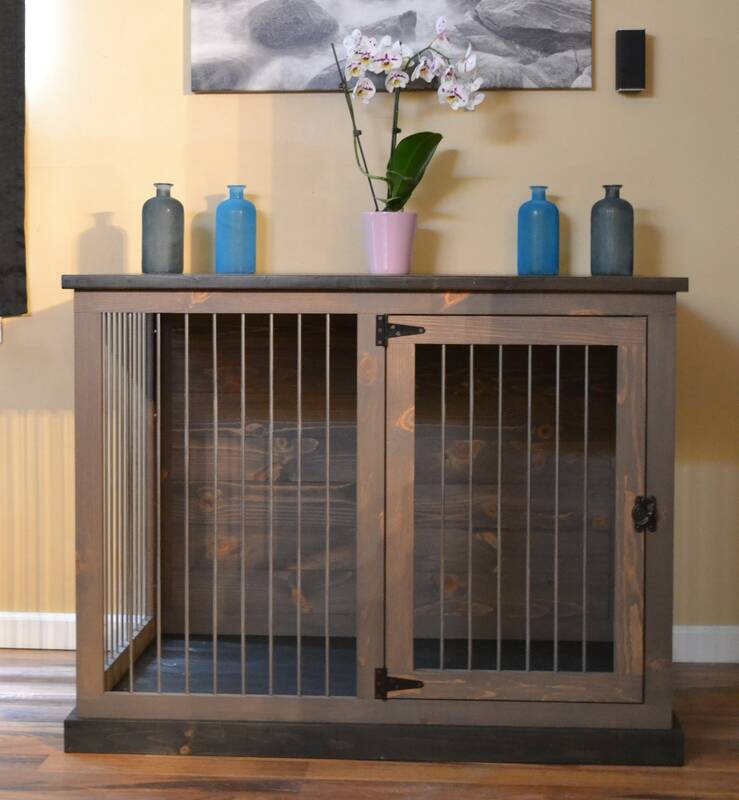 Custom crafted from pine wood and steel bar, these high-quality single dog crates transform your pets’ home into a stylish addition to your home’s décor. Each dog kennel features a 2.5” base, stylish locks, and matching hinges in brass, nickel, or black. 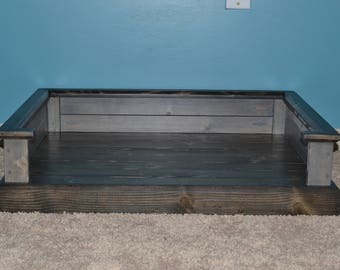 Available in 14 different stain colors allowing your new dog house blend seamlessly into your décor. *In order to keep conformity with bar spacing, some dimensions may change slightly during production. Also, each piece of wood contains its own character within it's grain accepting stain slightly different than another piece, this is all part of the rustic charm and out of our control. 🐶 *Shipping can cost as much as $400 for our pre-assembled dog kennels. Smaller kennels such as the Toy, XS, S, Med, and often the Intermediate, will be shipped to your home. However, The XL and XXL are available but will be local pickup only. 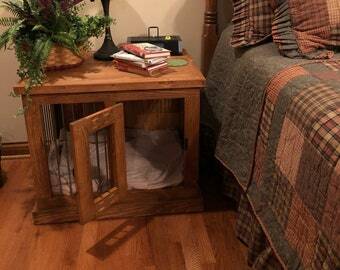 This dog crate is absolutely beautiful! The craftsmanship is superb! My Bella loves it! Definitely worth the wait while it was being built! I ordered kennel on 7/31/18, and received it on 10/15/18, damaged and unusable. I was very upset because I had spoken to the shipper (Charles and Ruthie) prior to shipping, and shared by concerns about possible damage that could arise. Assurances were provided that the item would be protected from the hazards of shipping. However, the kennel was wrapped with four thin blankets and minimum amount of small cell bubble wrap. There was no styrofoam or insulating material to prevent damage during ground transport. Moreover, cardboard enclosure didn't have any handle with care labels, nor fragile labels. Shared my frustration w/the shipper, and my options were a refund or a new kennel once their claim was settled with FedEx, which didn't make sense. Overall, no resolution, still no refund. Will not recommend if you have issues. We are truly sorry that your experience was not what you thought it would be. Throughout the entire process we allowed you to have full control, even after the product was delivered damaged. Repeated changes to the agreement from, color, size, material, rebuild, and refund became to hard to manage. After incurring more costs it was time to make an executive decision to offer you a refund. The added costs trying to please you needed to be recouped and a refund given. You and I had an agreement, solidified by your statement "Fair Enough", that payment of this refund would be due upon FedEx's settlement. We also know that putting Styrofoam, "Fragile" or "Handle with Care" labels will protect any product from a 6500 lb tow motor. We have sent many kennels packaged the same way without issue. 5 stars are not enough! I reached out to Dakor to see if they had anything “off the shelf” because I needed a dog crate much sooner. After some back and forth on what I needed- they offered to make a rush job for me and take off some of the extra shipping cost. The new crate arrived yesterday and it’s gorgeous! Perfect look to not make our bedroom look like the pet store. Gorgeous work and amazing customer service- highly recommend! Moral, ethic, communication, respect, and above all - honesty is very important for any purchase of goods/product between merchant and customer. This seller should re-evaluate his procedures to avoid any further issues. Production time, delivery, honesty, and attitude or customer service is highly valued. I suggest you take note of that. I wouldn’t recommend this vendor unless he can change and meet those demands. We are sorry to hear that you had some issues with the purchasing process. We hoped that we could rectify that during the case process. However, your mentioned values come into question when you try to circumvent the "Good Faith" policies of Etsy itself. Evidently, Etsy found that we did follow proper procedures when they close the case in our favor. The true issue arose when you refused to take possession of the item you purchased after the case was close in our favor. We hope that in the future that you will read the store policies, including but not limited to, return policies, cancellation policies, and refund policies. It may also be helpful to read the full ad in order to ascertain each companies methods of shipping or delivery. This may help to avoid any further issue with other sellers.